Is it just me, or does this remind you of something you’ve seen before? When I chanced upon the mini-herb garden post on Better Homes & Garden’s blog (click here), I felt kind of dizzy. But it wasn’t because of the vibrating gif, rather it was because the lead photo looked remarkably like a project of mine from December 2012. With almost 8,000 views, my succulent planter from a vintage fan blade cover project is an RR hit (click here). I’ve seen my photo (left) tons of times on Pinterest and other sites, so I wasn’t surprised that it might have inspired a virtual copy elsewhere online. Clicking through the BHG post, which was published in July this year, I chuckled; even the materials, how-to and accompanying photos echoed those of my own! I checked for a credit, or link to my post and found none. Instead I discovered that a BHG “style spotter” named Chelsey Andrews had created the post and that she blogged under the name The Paper Mama. At her blog (click here), I was amused to see this line in her post linking to the BHG piece, in reference to the planter: “You know what else this would be good for? 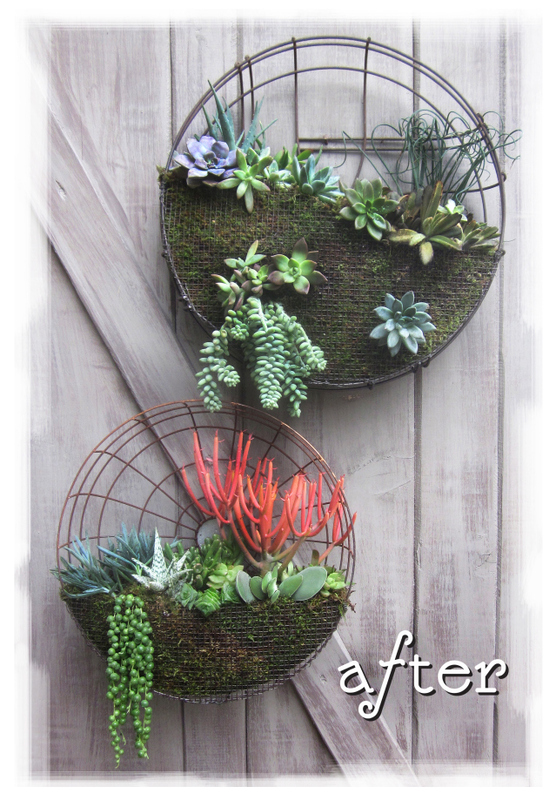 Succulents … “! The purpose of this post is not to shame Ms. Andrews, a creative, artistic young mom, as well as blogger, but after reading comments touting her project’s unique-ness I feel forced to make the following statement: Please give credit where credit is due. As a fellow creative person, I understand the pressures involved in coming up with blog content and craft projects for our waiting public and I understand how overbearing a deadline can be, especially a self-imposed one! Photos that appear on Pinterest boards and on other sites invariably contain links to their source sites … please, fellow bloggers, take the time to track down sources if they’re not readily apparent. If we treat each other’s work with respect, we can all be part of the “amazing, supportive” community Ms. Andrews has found as a blogger. There are creators and then there are copiers. You make the call. I am an admirer of your talents. Keep up the good work. I hope Ms. Andrews happens upon this post so she doesn’t make this mistake again! You should comment on her post with a link to your 2012 post… or is that being mean? I never meant to offend. I always try to give credit where it’s due, and I missed it here. I do my best to link anytime I’m inspired by another blogger, but it seems I forgot in this case. I do believe a quick email to me probably could have accomplished more than writing a post about me. I’m sorry I offended you. Remember, most of the blogging community is supportive. I want to support. Just email me. Handling this matter with a quick email was an option but I chose to deal with it publicly for two reasons: a) I think it’s instructive for others who might not be familiar with the journalistic need to credit sources; b) Comments responding to your posts were under the misapprehension that your project was unique when it was not. I go to great pains to come up with the projects I present on my blog, which usually involves a very personal creative impulse … to see the same project presented without credit is a negation of my time and creative energy. Surely as a fellow creative person and blogger you must understand why I would feel that way. Being a “supportive” member of the blogging community is obviously very important to you; it’s equally important to me. I wouldn’t say I was “offended” by what you say was an oversight, so much as mystified … I would’ve thought BHG’s online editors would’ve been more stringent. I appreciate your comment and am sorry you’re unhappy; I don’t think you’re a bad person. One more thing: My blog name is spelled Rancho Reubidoux. Could you please change it on your link to my post? Thank you! You are most worthy of imitation, Reuben! Yours was a FAN-tastic idea. This reminds me of one of the winning holiday cookie recipes featured in the December 2012 LA Times. It was practically, word for word, a direct steal from David Lebovitz’s website, where he had actually featured the recipe from a book with full credit given. And who wouldn’t want to be on David’s site? I zipped off an email to Russ Parsons, as others also did, as well as a post to “DL” (as many of us loyal followers call him) on his Facebook page. David has addressed the issue several times, and it elicited a short editorial follow up from Russ. Honesty is the best policy and blog love should rule. Good for you for calling this one out, as I, and many other readers, will continue to do in the name of fairness. Oh! And I still have today’s LA Times Saturday section to peruse through, with an eye to those cookie recipes!